First edition of Colton's important 1849 map of the United States on the cusp of the Gold Rush. Shows Texas at its fullest extant with a northern stovepipe panhandle. Identifies gold region near Sacramento. Map of the United States of America, the British Provinces, Mexico, the West Indies, and Central America: with part of New Granada and Venezuela. An exceptionally beautiful map of considerable historic importance, this is J. H. Colton's first edition 1849 map of the United States on the cusp of the California Gold Rush. Colton depicts the borders of the United States as consolidated under the 1848 Treaty of Guadeloupe Hidalgo signed at the end of the Mexican American War. The United States stretches from coast to coast with the Mexican Cession of Upper California or New California noted. Texas is rendered at its fullest extent as a state with its 1845 - 1849 borders, including the stovepipe northern panhandle. Alternative Texas borders and claims within the new state are also noted. Nebraska too is illustrated at its fullest extent reaching northwards as far as the Canadian border. Cartography in California remains primitive but the Gold Region on the Sacramento River around the town of New Helvetia, the original name of John Sutter's settlement, are noted. Possibly this map's most interesting feature is its thorough presentation of Texas - a topic no doubt much on the minds of Colton's educated American clientele. The map not only illustrates the borders under which Texas joined the Union in 1845, but also various alternative and conflicting borders actively debated during the Mexican American War until their ultimate resolution in the Compromise of 1850. These include highlights in blue showing Mexican claims as far northeast as the Nunces River - a major catalyst of the Mexican American War. Those who argued for a border at the Nunces River also argued that the border should continue north along the Guadeloupe Mountains roughly to the Red River Valley. Still other borders recognize old Mexican distinctions relating to the governance of Santa Fe. These were eventually resolved by the Treaty of Guadeloupe-Hidalgo in 1848 and the subsequent Compromise of 1850 which firmly fixed the borders of Texas much as they are today. The United States' other new acquisition, Upper California, is presented in a primitive form predating substantive updates derived from Fremont's explorations. Sacramento still appears as New Helvetia, the name John Sutter gave to his Mexican grant before discovering gold in the region. The cartography along the Sacramento River and its tributaries remains vague and incomplete, a fact which would soon change as explorers and gold prospectors flooded into the region. In the Great Basin little is known. The second edition updates this region considerably adding Fremont's Route along the Humboldt River and several new mountain ranges. One subject of some interest in this region is a note at the convergence of the Colorado and St. John's River that reads 'Supposed Residence of the Aztecs in the 12th century.' This references the German naturalist Alexander von Humboldt's analysis of codices and other indigenous legends regarding the 12th century Aztec migration into the Mexico valley from somewhere far to the north. Also noted in modern day New Mexico, but what was is here Texas are the Ruins of Gran Quivira. These extensive Anasazi ruins were plundered by Coronado and settled by Spanish missionaries in the 16th century. They are often associated with legends of the apocryphal Seven Cities of Gold sought by many early conquistadors. Colton has also noted several routes related to the American Westward Migration. These include the Oregon Trail, with distances noting from Westport Landing, Missouri. The Santa Fe Route, also running from Westport Landing, appears further south. 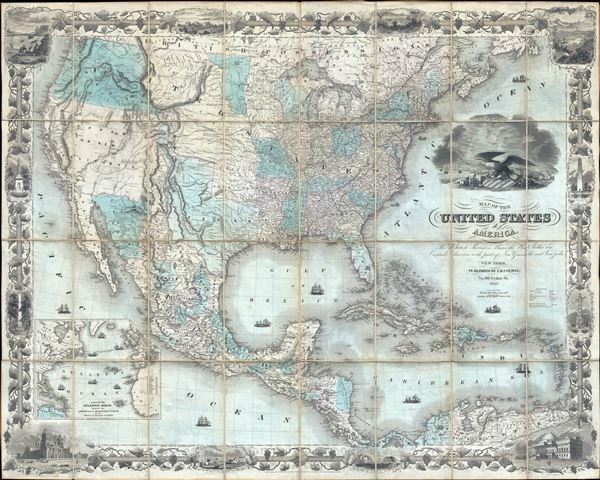 In addition to migrant routes, the map also details military routes, including those taken by General Kearney in 1846, John C. Fremont, and General Wool, among others. Throughout indigenous American Indian Nations are meticulously noted. An inset has been added to the lower left quadrant detailing the Atlantic Ocean and several trans-Atlantic shipping routes. These include the New York - Boston - Halifax - Liverpool route. Various other routes run from the Havana to Madeira and spider-web throughout the West Indies. No fewer than 15 decorative ships, including both tall ships and steam vessels, decorate the seas. The dramatic cartouche image includes a large Bald Eagle sitting astride a stars and stripes armorial shield and various trade goods. A bustling port scene appears in the background. The map is highly decorative and evocative of John M. Atwood's personal style. Although Atwood himself engraved only the map proper, with the border design and pictorial engraving being the work of W. S. Barnard, the whole is so indicative of Atwood's style we can only image that he supervised the full engraving process. The map is surrounded by an elaborate grape vine border with numerous pictorial vignettes. The four primary vignettes illustrate, clockwise from top left: salmon fishing at Willamette Falls, Oregon; the valley of the Connecticut River as seen from Mount Holyoke; the Capitol Building, as yet incomplete, in Washington D.C.; and the cathedral of Mexico City. Lesser vignettes at the top and bottom of the map illustrate John Jacob Astor's fur trading outpost in Astoria, Oregon; Lake Saratoga in New York; Mexican's catching wild cattle; and ships entering a port. To the right and left of the map are illustrations of the Pulaski Monument in Savanna, Georgia; the Battle Monument of Baltimore, Maryland; the Bunker Hill Monument in Boston, Massachusetts; and the Washington Monument in New York City, New York (no longer extant?). Two editions of this map were issued in 1849, the present example being the first. The first edition generally appeared as thus, dissected and mounted on linen (its most desirable format), or mounted and canvass with rollers as a wall map. The second edition, issued later in 1849 in anticipation of the Compromise of 1850 shows Texas with more restrained borders as well as updates relating to the explorations of Fremont and the discovery of Gold at Sutter's Mill. The second edition typically appears on a single sheet of onion skin paper folded into a pocket map style binder. Both maps offer much of merit, but this, the first edition, is generally considered more desirable both for reasons of format and content. Very good, near fine example. Dissected and mounted on linen in 32 panels. Original linen. Rumsey 5535.001 (2nd edition) Boston Public Library, Leventhal Center, G3300 1849 .C65. New York Public Library, Map Div. 01-5133. OCLC : 47017064.